I know with so many children starting school for the first time, lots of us will be battling the sterotype of teachers within the EYFS and the children “playing all day long”. 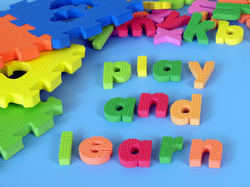 We as teachers all know that children learn best through play and playful activities. So when children go to school, although they may seem to be just playing, we know they are learning key skills, knowledge and attitudes that set them up as life long learners. Play underpins the EYFS and all aspects of children’s development. Through this vital play, children develop language skills, their emotions, creativity, social and intellectual skills. For most children their play is natural and spontaneous although some children may need extra help from adults. Play takes place indoors and outdoors and it is in these different environments that children explore and discover their immediate world. It is here they develop and practise new ideas and skills, they take risks, show imagination and solve problems on their own or with others. Our role as adults working within the EYFS is crucial. We must provide time and space and appropriate resources so that play can take place. These resources need to be a mixture of items that will inspire play and enlighten children’s imaginations. We then need to observe play and join in when invited, the importance of watching and listening before intervening I can not stress enough. Through these observations we make, we can then adapt our provision to ensure all children are making progress. We value play and it is up to us to provide safe but challenging environments that support and extend learning and children’s development. We all know that children learn in a variety of ways and display certain characteristics that enable us as their teachers to find out their learning styles and attitudes to learning in greater detail.Through observations of children within their play, we will start to unpick these characteristics and develop our provision so that it encourges children to develop and understand their own characteristics. I wish everyone luck for the upcoming academic year. Let’s play, learn and work together!